Bodum is a premium brand of kitchen supplies, and they have a wide range of products. Even though they’re usually higher quality than the typical store brand and even other major brands, they don’t cost all that much more. They have some very affordable electric kettles (Including options under $20), and they also have some premium models with extra features. The right size: You may want a smaller one that holds less water, so that you can boil smaller amounts more quickly, or you may want a bigger one if you’re making coffee or tea for a larger group of people. Your budget: Are you looking for something cheap just for getting by, or looking for a premium option and don’t mind spending more? We’ll cover the gamut and make sure that we’ve got high quality options for any budget. Style: Are you looking for a certain color, or style, to fit in with your kitchen? If you don’t really care how it looks, that leaves more doors open, and if you’re looking for a particular look – hopefully we’ll have you covered none the less. Features: We’re also going to look at a variety of different features that you’ll find in an electric kettle. More powerful ones will generally heat up water a lot more quickly, whereas cheaper ones may take a few minutes. An auto shut-off is another important feature, if you fall back asleep then it’ll turn itself off before all of the water boils away and you risk damaging your kettle. Definitely something to look for, among other features. 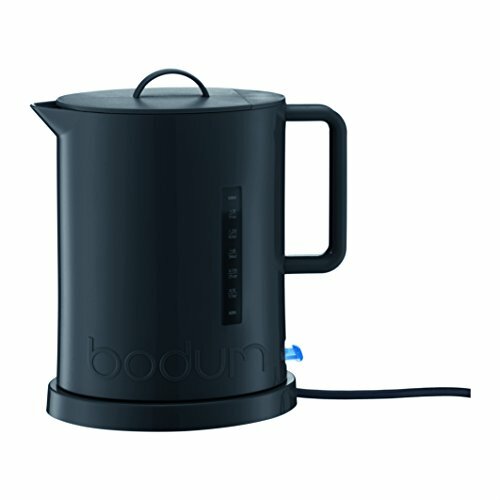 From simple and cheap, to full-featured and ultra-high quality… here are the BEST electric kettles that Bodum makes, to fit anyone’s needs. We’ve divided them into the following categories. If you want to get right to the point, here’s a quick description of each category, which one is the best, and a link to go directly to Amazon to learn more… Otherwise, keep reading to learn more about each kettle, and why it might be the perfect fit for you! 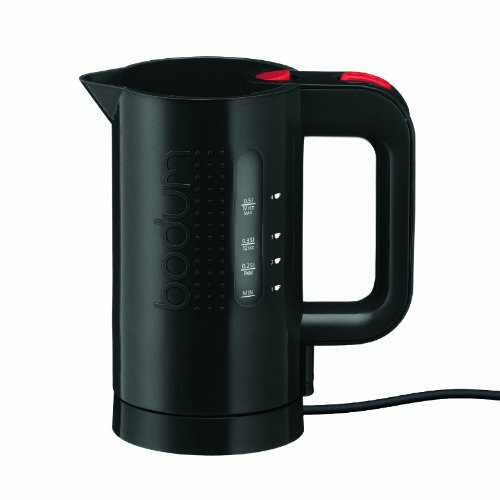 Best Overall – Bodum Ibis [Shop Now]: This one falls somewhere in the middle when it comes to price, but offers an INCREDIBLE value for the money. Very well made, durable, and extremely well-reviewed. Best Cheap Option – Bistro 17oz [Shop Now]: If you would rather save a few bucks and aren’t interested in all the bells and whistles, but still want a solid kettle, this is the way to go. Best Premium – Bistro 37oz [Shop Now]: Looking for something higher end? Here’s a beautiful option. 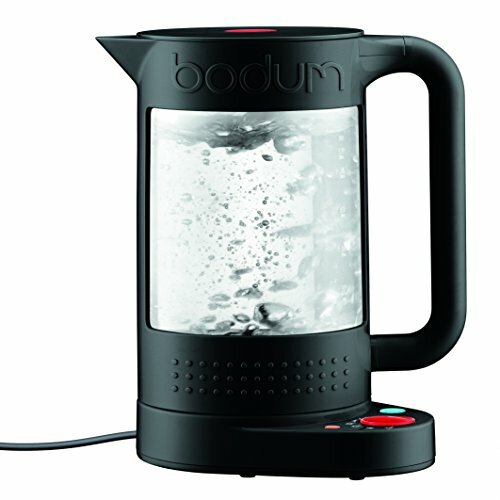 Overall, this Bodum kettle hits all the right notes when it comes to quality, features, and price. It’s quite a bit less expensive than the premium option, and it’s also in a range that makes it a suitable upgrade for anyone who is looking for more than our budget option offers. While the price puts it in the middle of the road, the quality is still exceptional and it’ll last you a very long time. It’s made from BPA-free plastic, of course, has an auto shut-off for safety, and comes with a 1 year warranty just in case you run into any problems, which is unlikely. Sometimes, bigger ones will boil more slowly than slower ones, since it takes longer to boil a larger quantity of water, but this one’s surprisingly quick. As a comparison, we checked out a Chefman kettle on our YouTube channel (video here) that took about 8 minutes to come to a complete boil, but this Bodum unit takes less than half that time. This 17 oz kettle comes in black, green, red, and white colors so it’ll match any kitchen. You can also find a 32oz version, just select that option on Amazon. It has a steam sensor for automatic shut-off once your water is boiling, which is an important safety feature. There’s a water scale on the side so you can see how much water is inside of it. There’s a simple on/off switch, a filter built into the lid, and a heating element inside that doesn’t come into direct contact with the water. It heats up relatively quick, since it only holds about 4 cups. It sits on a 360 degree base which is handy, you don’t have to line it up perfectly every time you pick it up or put it down. The mesh on the lid is helpful to catch any chalkiness from the water when you pour it. It’s great for making coffee, all types of tea, boiling water for instant noodles, any anything else you might need hot water for. It’s a basic model, but it looks sharp and gets the job done for a very low price. Here’s the premium version of the Bistro, it’s larger and has better parts, and more features. The base has buttons that allow you to dial in a variety of different temperare settings so it’s perfect if you’re making a delicate white tea, or a more robust black tea, or anything in between. It holds 37 ounces, which is enough to make 8 cups of boiling water, and it works FAST. It’s made with BPA-free plastic, is double-walled, and can keep the water hot for half an hour after it’s done boiling. There’s a manual on/off switch and a light that indicates when it’s powered on. There is a sensor that will turn off this kettle once it has reached the target temperate to ensure that if you get distracted, or fall asleep, or have to rush out of the house for an emergency, that it’ll turn itself off instead of continuing to boil until the water runs out. It’s made from ultra high quality borosilicate glass, along with plastic on the outside, rubber, and stainless steel. It performs at 1500W, package a powerful punch to get your water hot without having to wait around all day. There’s a mesh screen to capture any chalk or impurities in the water, and the water only comes into contact with glass – so if you’re concerned about having boiling water in a plastic container, this is the perfect option to address those concerns. It does cost more than the previous two that we looked at, but we’re confidant in saying that you get what you pay for, and more, with this electric Bodum kettle. Just to wrap things up, regardless of which one catch your eye, all 3 of the kettles on this list are great. We wouldn’t include something that didn’t meet our standards, so there’s no “wrong” option here. Go with whatever appeals to you, fits your budget, and you’ll be all set. The most expensive option on this list, the 37 oz Bistro, is very appealing since the water only comes into contact with glass, opposed to the other ones where the water will also touch their BPA-free plastic. Some peopel are concerned about hot water touching plastic, even if it’s BPA free, and other people aren’t too worried about it. We wanted to include something for everyone, so if that’s a major criteria for you, go with the premium option – especially if you want to use the other features like advanced temperature control. But if you just want to get your water boiled quickly by a kettle that’s going to last you a long time, either of the other two choices will do just fine. If you don’t boil much water at once, you’re in luck, grab the cheap option and be done with it. If you boil a lot at once, then the “best overall” choice is going to be a good bet for you.